This privately owned cottage is cozy, comfortable, well-equipped and very conveniently located. Summer rentals are from Saturday to Saturday. GREAT LOCATION!!!! *** PLUS .... 2 Full Baths , Central A/C, 3 TVS, DVDS, VCRS ...CABLE, * WI FI* and on demand Hot Water. This cottage has great location and comfortable beds (especially in the master) it will add EASE,CONVENIENCE AND COMFORT to your vacation... with only a one minute easy walk to beach, restaurant, tennis courts, barbecue, shuffleboard, live entertainment, beach activities and much this cottage still offers....... quiet and privacy. The cottage also has a full size kitchen with all the cooking items you would need. The kitchen has a dinette with windows all around, pretty, bright and easy to cook in with an open concept to the den area. The Den has a full size sleep sofa, Cable TV, VCR, Central A/C , Stereo *WIFI* and the comfort of a ceiling fan. This cottage has 2 living rooms each with a full size sofa bed and a TV. There is a sliding glass door that divides each living rooms for privacy. Master Bedroom has a Queen size bed, Cable TV full closet, ceiling fan and private entrance to bath with shower/tub. Second Bedroom... has 2 Twin Beds. Outside door and a private entrance to full Bath with Shower. I call this cottage "the happy cottage" because when I wake up there... I am always "happy". We think it fair to have a cancellation policy since the reserving and holding that time has not allowed us to rent to others. Also rescheduling the vacant week at such a late notice would be difficult due to planning time off from work, etc. ... If written ...Notice of Cancellation... is received, in writing on or before 90 days prior to the Scheduled arrival date, all money paid except for $50 rescheduling/holding be refunded. prior to the Schedule arrival date, a cancellation fee of 1/2 of the full rental fee and appropriate tax will not be refunded. If... both payments (first and last) tax and security deposit were paid.... a refund of 1/2 of the full rental fee plus 1/2 tax and full security deposit will be refunded. If one payment plus security deposit was paid, only security deposit MINUS ... the appropriate taxes will be refunded. 30 Days or less notice ... only security deposit will be refunded. If however, we are able to re-rent your week even if given short notice we will refund all Moneys minus the $50 rescheduling fee and any added expense occurred in re-renting. Again if you notify us in writing on or before 90 Days of expected date of arrival, we will refund ALL money paid except for $50 rescheduling fee. **** If however, we are able to re-rent your week even if given short notice we will refund all Moneys minus the $50 rescheduling fee and any added expense occurred in re-renting. I have been renting there since 1997 and only once did this come into play. Given short notice, I was able to re-rent at a lesser amount and refund that rental fee minus the $50 fee. Our goal is for our guests to have a happy, funfilled, safe vacation...A time to relax and enjoy family and and to add to their comfort and convenience. Our cottage is located within Point Sebago Beach and Golf Resort, a 775 acre family resort, and only steps from a beautiful 55 sq. mile lake with the country's finest salmon and bass fishing and... nearly one mile of sandy beaches. Amenities include On Site Restaurant, Marina, 18 Hole Golf Course with Pro Shop, FREE Five-Star Supervised Children's Programs, Hourly Adult Activities and Tournaments, Evening Family and Adult Entertainment, Happy Hour, 300 Seat Sebago Lounge Nightclub,and much more. Once you are so much to is no need to go on day trips. Although, North Conway's (tax free) factory outlets are only 75 minutes away and the Great Portland Mall only 60 minutes away. E-mail for more information on sleeping arrangements and availabilty. Enjoy ....All that Point Sebago....(Maine's Premier Beach and Golf Resort)...... has to offer!! Hello to All... Being self-employed and having limited vacation time, made us choose Point Sebago. Why??? The answer to that question is... we did not have vacation time that we could take a chance with. We knew we needed to relax and have a good time and enjoy being together. Also we needed a place where we all had fun and a place that made us happy. That place was Point Sebago. After camping at Point Sebago for many knew we loved it there. When Point Sebago started to sell resort cottages, we had to act fast to have this great location!!! We also knew because we could not take all summer off, that we would need to find others that would share this summer vacation home with us. We have shared these cottages with people that have become friends although, we have never met. We just love it. This cottage has a great location and will add comfort, ease and convenience to your vacation. Although Point Sebago started as a Campground... this is not even pretend camping. Great mattresses, two baths, central air and cable. Yet, the atmospere is very comfortable and relaxing. ....Including campfires!!!! The unique benefits of Point Sebago is... it is all here!!! A 45 square mile lake, marina, golf course, restaurant, tennis, Activities for ages 3 to adult. Point Sebago is a place to be active or a place to just relax and enjoy beautiful scenery... it is all here. One of the best benefits, Point Sebago is a place to get to know people that are on vacation, too. People that you would other wise have never met ... that become your friends for life. How Unique Is That!!!! Point Sebago has a beautiful Beach PLUS... Golf Course/ Marina/ Restaurant/Activities for all ages/ live entertainment and Fun!!!! Cottage has Internet for your Convenience making it easy to keep in touch. Our cottage has 2 living rooms each with sofa bed. Sliding glass door provides separation for privacy. Toaster Oven, Blender, 3 Door Refrigerator with bottom freezer. Plus kitchen is well stocked with dishes, glassware, silverware, pots and pans, etc. Please bring your own bike and enjoy beautiful Point Sebago!!!! There is a Marina where you can rent boats or bring your own boat and rent a boat slip from Point Sebago!!! Central A/C, ceiling fans, (3) CABLE TVS, CD and INTERNET. SORRY, NO PETS//NO SMOKING, covered out side a area provided. On-site general store, boutique, laundromat, boat slip and boat rentals, pool, ping pong, arcade, tot lot, supervised children/adult activites and choice of Point Sebago's nightly entertainment. Beautiful views and the joy of being on vacation with others that are on vacation, too!!! I stayed at this property for Labor Day weekend. 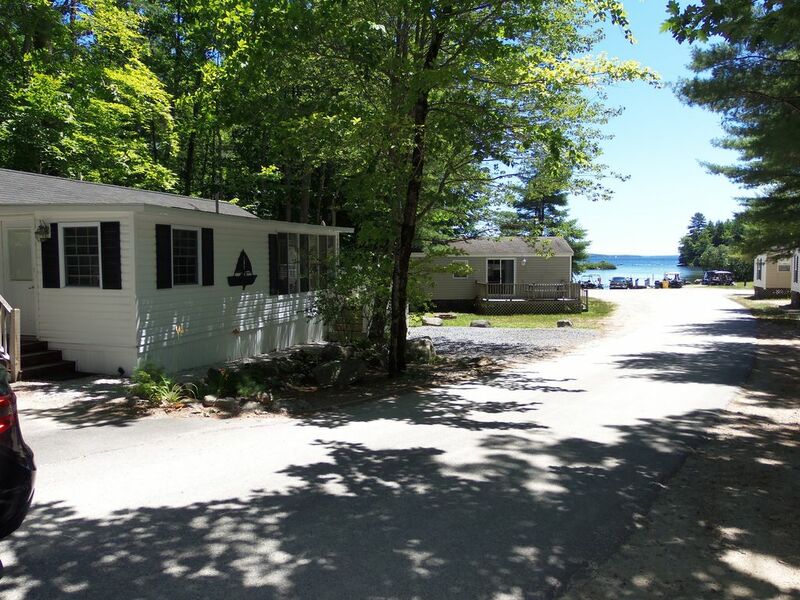 It is fully stocked with all your needs and has plenty of room to relax and enjoy your time at Point Sebago. The owner was super attentive to my needs and was great to work with during my stay. You are close to all the great things that Point Sebago offers within their property and yet far enough away where you can relax away from the hustle and bustle. We've been in both cottages. They are just beautiful, decorated, comfortable, everything you would need. Close walking distance to the beach and all activities. It's worth the stay, owners are very fussy about the cottages and insist everything is perfect for their guests. an 18 hole Golf Course. There is so much to do and enjoy. There are activity programs for Adults as well as Children. It is a great place to meet others that are on vacation, too. Many become friends for years... people that you would have otherwise never met. Have fun with others on vacation or just relax and enjoy Point Sebago and it's Beautiful View and Atmosphere. This cottage has a great location and will add ease, comfort and convenience to your vacation. Easy to come and go if your children are little. If your children are older, they too enjoy the convenience of the area. Convenient to activities, friends and Fun!!!! So many activities....Pt. Sebago is a great place to learn and how to loose and still have fun!!! !